Long ago and far away at the famous Pinewood Studios in England, my six-year-old son, Gregory, won a part as a “flying boy” in Santa Claus: The Movie. I was also hired has his chaperone or wrangler in movie-making terms. I was surprised that my son taken himself into the auditions held at his American School outside of London. When I asked why, he said he thought it would be fun. Me, too. And easy, since from the time he was four-years-old, my darling little redhead modeled for Seattle department stores and took direction really well. What he didn’t tell me was that he thought he was going to meet Santa Claus on the movie set. In the movie, a runaway elf created magic lollipops from the sparkling dust that made Santa’s reindeer fly. Children who ate the lollies flew, too. Before we started rehearsal, Gregory had to take lessons with the famous flying unit that had done the Superman movies. We were both excited when they strapped him in the harness, attached the wires at either side of his waist, and the stagehands hoisted him. His little body instantly zipped up fifteen feet in the air and tumbled head over toes, round and round. When they lowered him to the floor, the screaming stopped. Despite the flying unit’s adjustments and coaching, Greg proved to be too small to find his center and not spin on the wires. But he wanted to continue to try to learn to fly. Of course, I discovered later that he believed he had to fly in order to meet Santa Claus. Instead of torturing the boyfurther, the flying unit decided to lay Greg on his stomach at the end of an extending rod on a snorkel lift. And with Christmas movie magic, he flew into a kitchen where he snagged a cookie from the jar his movie mom put on top of a cabinet and waved. After several takes, it was I he waved at as the director placed me on the floor at the movie mom’s feet where I wouldn’t be in the shot and could coach my flying boy. Personally, we believe it’s the best scene in the movie. 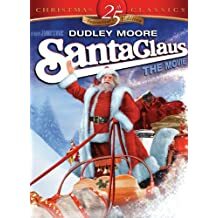 If you see Santa Claus: The Movie this Christmas, be sure to watch for the darling redheaded boy flying into the kitchen to steal a cookie, but who never got to meet the jolly old elf the movie was named for. He was filming on a different soundstage at Pinewood Studios. The GHOSTLY ACTS audiobook isn’t an ordinary narrator reading version, it’s EXTRAORDINARY! The multiple award-winning novel is narrated by Tweet Productions in the style of a radio play with music, sound effects and voicing each character differently. As for how I decided to produce this book as a play. First and foremost, Melinda, you wrote it like that. MOO — Ele’s mother — is so VERY melodramatic. I think I had the most fun with her lines. I really did. She was so over the top, and when I was narrating the book, I was actually using hand gestures when I got into her character. I would purposely narrate each of her lines two or three times — just to get it right. And then, in the post production process, I upped the tempo a bit plus gave her a treble boost. This is the reason she sounds so “crisp.” This was intentional on my part. My production efforts spring from the words you wrote, Melinda. If there’s a knock at Ele’s door, you’re going to hear that knock. If Ele is creeping up some creaky stairs, you’re going to be there with her. If she’s dancing onstage to a waltz from an old hand-cranked Victrola, you’re going to hear that. In other words, Melinda, you’re the one that created those elements, not me. I just inserted them. You have a very visual writing style (you would have done well as a TV reporter!) that creates images. That’s what radio is all about and always has been. It’s Theater of the Mind. Ghostly Acts is one big theater act from start to finish. . .those last few chapters took an entire day — ten hours of work — to fully produce. I can’t say enough about the musicians and composers who are throwing their work online for anyone and everyone to use. They are just amazing. It’s the same thing with people who create sound effects. Although I created many of the effects that are in the book, some were grabbed from one free source or another and modified to fit the novel. The scene where Club Foot, for example, drags his foot across the floor when he smashes through a wall? That’s actually a heart beat sound effect that I modified a great deal to sound like a Club Foot being dragged across the floor. You can create all kinds of magic with digital editing programs. The narration was recorded with a Yeti USB microphone — the first time I’ve used this. Some of the sound effects were also created with the Yeti. Some were created with just an iPhone, but then heavily modified (produced) through the Audacity audio editor. I think I liked producing the chapter where Ele is dancing with Steven the most. It was so very visual. I even found the “tick-bump-tick” of an old Victrola online. Of course, I used it! Last Halloween when we were in Sedona, Az at The Enchantment Resort, this critter that looks like a raven explosion landed in my life. He has been sitting upon my desk in my playroom and has been known to quote Poe. He is of course recommending my two award-winning ghost stories for your reading pleasure this Halloween. GHOSTLY ACTS and THE HAUNTING OF JOSH WESTON. “Read these spooky fun ghost stories,” quoth Ray the Raven. This is a picture of my playroom where I’m spending happy creative time since The Wild Rose Press contracted the outrageously fun first book of my Dark Inclinations series, BITTEN: Confessions of a Menopausal Vampire. The book’s due to my editor mid-October and will be a Wild Rose Press Black Rose line release in eBook, paperback and audio. Speaking of audio, while I’m getting up to dark fun and games with my menopausal vampire in the Seattle underworld, both of my YA ghost stories are in audiobook production. The GHOSTLY ACTS audiobook will have exciting production effects and music that will make listening to the story a great immersive experience. THE HAUNTING OF JOSH WESTON’s narrator sounds just like the Josh of my imagination. How lucky is that!! Heigh ho, heigh ho! Mmmmm’s off to play with the menopausal vampire! Melinda Sells Out at PNWA! I’m a longtime member of Pacific Northwest Writers Association. PNWA is one of the largest regional writers organizations, and over five hundred writers attended the annual conference last week. This year’s literary contest had a thousand entries in twelve categories. I try to attend the annual conference where I serve on panels, teach workshops and hang out with talented writers. I also enter one of my new projects in the literary contest to try out the opening on reader/judges. My new YA thriller, The Boyfriend App, won a finalist award in the Romance category. It was my pleasure to meet two Wild Rose Press authors, Christine Grabowski and Kerry Blaisdale, and sit the Autograph Party with them. The picture of me behind my two award-winning YA paranormals on the left is the “selling out” I’m referring to. It was a grand party and I had an autographing good time! THE HAUNTING OF JOSH WESTON Available Worldwide August 20, 2018–TODAY! Melinda’s new multiple award-winning YA paranormal thriller, THE HAUNTING OF JOSH WESTON, from The Wild Rose Press is available in eBook and paperback at retailers worldwide. An audio book is coming soon! Blurb After the death of his cousin and his father’s subsequent death in Afghanistan, former star athlete and gifted student, Josh Weston and his mother move to a desolate ranch in the Arizona desert. Josh blames himself for his father’s death and for the shooting of his best friend. Besides giving up on everything he used be great at, he is relentlessly bullied at his new school.Unable to see any way out of his problems, he tries to end it all one moonlit night. Two of the mystical ranch’s ghosts stop him and pull him into dangerous tests of courage and intellect. Josh must learn to draw on his strengths and confront the haunted past that threatens his life and possible future with the beautiful and daring girl next door. “Magical and moving. The Haunting of Josh Weston by Melinda Rucker Haynes is a powerful YA paranormal tale that offers lots of emotional insights and a message of hope to anyone who is suffering insecurities and bad memories. The action is quick-paced as the tension between Josh and the bully builds, but the relationship between Josh and Pete provides a timeless feeling and a sense of love and support that Josh’s mother just can’t provide by herself. With a subtle romantic element, there is just the right balance between the paranormal and the everyday to make the story quite believable and uplifting. Excellent story – kept me glued to the pages! The Haunting of Josh Weston is certainly well worth reading. Rated: HIGHLY RECOMMENDED for ages 8-100! Before becoming a multiple award-winning, best-selling fiction author, Melinda Rucker Haynes worked as an adult education research project director and published nonfiction. She jokes she learned to write fiction as a grant writer who moonlighted as a corporate trainer of fascinating people working at an area in the Nevada desert that didn’t exist. After gypsying around the world, living in four foreign countries—most recently Washington D.C.—Melinda continues to search out enchanted stories beyond her imaginary magical story pool in ghost towns, massive cities, vast night skies, and mysterious ancient sites throughout the world. Her interests and hobbies include magical story pool fishing and encouraging her citrus trees, fairy gardens, and fellow magical thinking enthusiasts. Melinda also enjoys frequent fantasy flying, past lives exploration and opus magnum experimentation. Her young adult paranormal novels, Ghostly Acts and The Haunting of Josh Weston (Escondido Magic Series) are multiple award winners as is her paranormal romance thriller, The Eternal Trust, the first book of the Soul Searchers Series for The Wild Rose Press. Melinda is currently working on her new and already award-winning YA paranormal, The Boyfriend App, and Josh Weston’s second adventure in the Escondido Magic Series, coming in 2019. The second Soul Searchers book, Breach of Trust is also 2019 release. A menopausal vampire has been doing hot laps in Melinda’s magical story pool and her tale, BITTEN: Confessions of a Menopausal Vampire is coming soon.